Washington C.H. City Manager Joe Denen and city council chairman Jim Chrisman signed a proclamation recently proclaiming Feb. 3, 2019 as Four Chaplains Sunday. From left to right, Ed Helt, Americanism chairman for American Legion Post 25, Joe Denen, city manager, and David Frederick, chaplain of AML Post 25 and member of First Baptist Church. In commemoration of the dramatic sacrifice of four armed forces chaplains during World War II, the local American Legion will observe Four Chaplains Sunday on Feb. 3. Legion officials and clergymen around the nation are planning special programs for the observance of the 76th anniversary of the sinking of a U.S. troopship, and the heroism demonstrated by four valiant chaplains who were aboard the doomed vessel. These four — a Jewish rabbi, a Roman Catholic priest and two Protestant ministers — calmly helped to issue lifebelts to American servicemen aboard the troop transport when it was torpedoed off the coast of Greenland on Feb. 3, 1943. When the supply of lifebelts was exhausted, the chaplains removed their own and gave them to four soldiers, and were seen on the deck of the ship with their heads bowed in prayer, as it slipped into the icy sea. Officers and members of local American Legion Post #25, along with auxiliary and S.A.L. members, will celebrate the historic event by attending the 10:30 a.m. Sunday worship service on Feb. 3 at First Baptist Church, 301 E. East St. in Washington C.H. 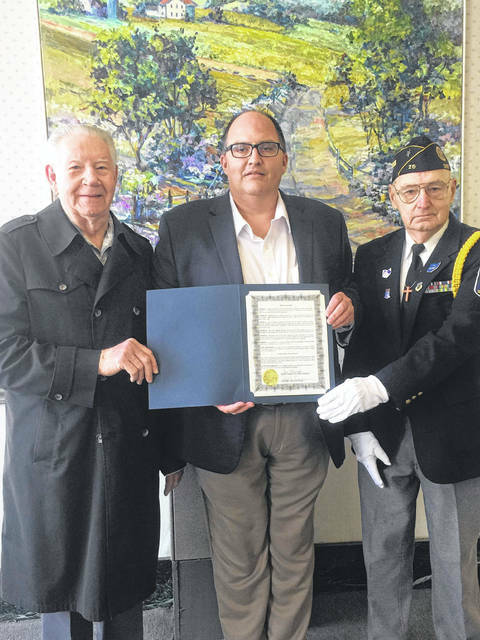 Americanism chairman Edward Helt and chaplain David Frederick, of Post 25, said that other veterans in the community are more than welcome to attend the service and celebrate the special event. Rev. Joseph Current and other officials of the First Baptist Church said they are looking forward to hosting the veterans for such a special occasion. https://www.recordherald.com/wp-content/uploads/sites/27/2019/01/web1_received_608638526252022.jpegWashington C.H. City Manager Joe Denen and city council chairman Jim Chrisman signed a proclamation recently proclaiming Feb. 3, 2019 as Four Chaplains Sunday. From left to right, Ed Helt, Americanism chairman for American Legion Post 25, Joe Denen, city manager, and David Frederick, chaplain of AML Post 25 and member of First Baptist Church.